Welcome to Fish Window Cleaning! We are your local window cleaning company for Huntsville, Madison, and Decatur, AL. We are genuinely pleased to offer the most professional and consistent service in the industry to our clients. Our window cleaners have the pride of ownership, and that pride reflects in our work. Every time. Day in and day out. We know your home is important to you and it's important to us too! That's why we work hard to make your windows, chandeliers and other light fixtures, skylights, and more sparkle! By choosing FISH as your professional window cleaning company, you've taken a big step to help keep your home consistently looking it's absolute best. Whether you need your windows cleaned once a month or once a year, we're here to help! Our window cleaners are professional and respectful of your home. We use cloth pads underneath your windows and wear clean shoe covers to protect your carpet and wood floors. We're careful when moving around your possesions inside your home and around your outdoor plants, furniture, and cars when cleaning exterior windows. We understand that business owners want their business to always have a polished, professional appearance. That's why it's important to hire the best window cleaning company out there! Don't just hire any window cleaner with a bucket and a squeegee! Fish Window Cleaning started cleaning windows in 1978 and has over 125,000 satisfied commercial and residential customers nationwide! 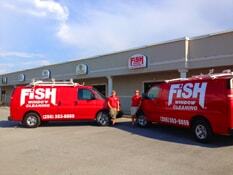 We are licensed, bonded, and insured so when you hire FISH, you have nothing to worry about. We focus on your satisfaction. That's why we offer customized programs with cleanings ranging from weekly to annually. We work hard to meet your schedule, needs, and budget. No job is too big or too small for the FISH window cleaners! Learn more about our residential window cleaning services and commercial window cleaning services. FISH is a hassle free service. No contracts are required! Our team is trained and uniformed. All employees are trained with a premier safety program. We offer customizable cleaning programs and schedules. We show up when we say we will be there!